Last month, Audi of America announced the sale of their 93,507th vehicle in 2010, breaking an all-time U.S. sales record. At the time, the month of December was not even half-way over, which begged the question; "how many cars will Audi sell in 2010?" Today's annual sales figures provide an answer worth celebrating. With 101,629 vehicles sold in 2010, Audi not only shattered their previous all-time U.S. sales record but also marked the first time the brand has sold over 100,000 vehicles in the U.S. in one year. A major milestone to say the least. - December 2010 marks the best fourth quarter in Audi of America history, leading to all-time U.S. sales record topping 100,000 vehicles for the first time. - Historic 2010 sales propelled by demand for TDI clean diesel vehicles, as the Audi Q7 TDI and Audi A3 TDI account for over 43% and 53% of sales mix, respectively. Audi today announced all-time record U.S. sales of 101,629 vehicles sold in 2010, surpassing the prior record of 93,506 vehicles sold in 2007. Due to strong and continued consumer demand for Audi premium vehicles, 2010 marked the best year Audi has ever enjoyed in the U.S. market. The new Audi record resulted from record performances in all three U.S. regions. 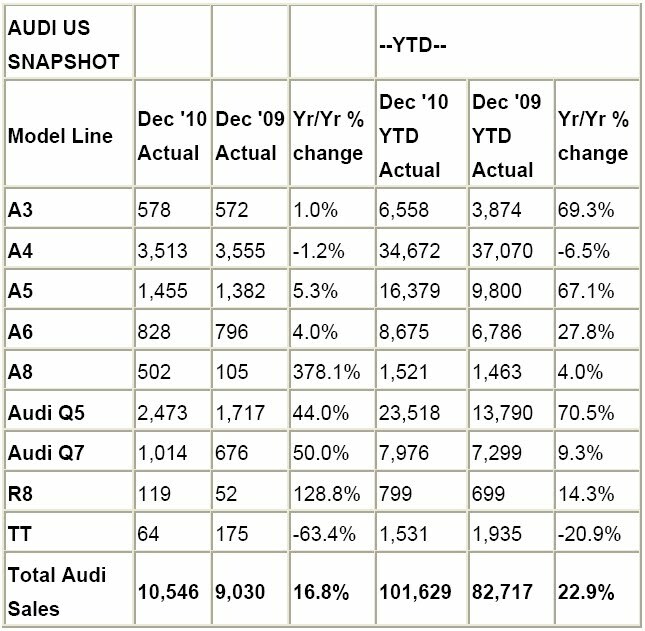 In December 2010, Audi reported sales of 10,546 vehicles, a 16.8% increase over the 9,030 vehicles sold in December 2009. For the full year of 2010, Audi new sales rose nearly 23% versus its prior full-year total of 82,716 vehicles sold in 2009. Last year marked the expansion of the Audi lineup to more than 10 models and nearly 20 variants. It was also distinguished by the strong sales debut of the redesigned 2011 Audi A8 flagship model – the most technologically advanced vehicle Audi has ever produced. Audi A8 sales (since the vehicle’s release in November 2010) totaled 812 units in 2010, comprising over 53% of CY 2010 A8 sales. One of Audi’s hottest selling models included the Audi Q5 crossover, with sales jumping 44% in December 2010 when compared to December 2009, and 70.5% for the full year of 2010 when compared to 2009. Additionally, clean diesel sales continued to reflect the surging demand for fuel-efficient models as the Audi A3 TDI accounted for nearly 53% of vehicles sold in the Audi A3 line. 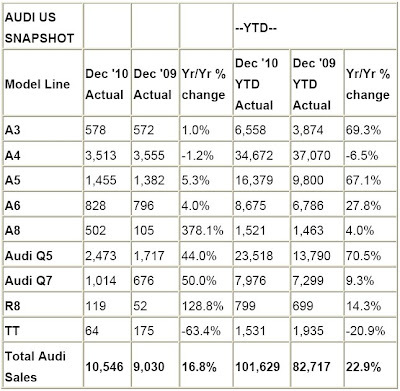 The setting of an all-time U.S. sales record in 2010 clearly signals that Audi’s powerful brand momentum will build throughout 2011. The strength of the Audi portfolio will continue to be on display with its fourth consecutive commercial appearance in next month’s Super Bowl XLV game. Over the next few years, Audi will sustain its long-term investment strategy. 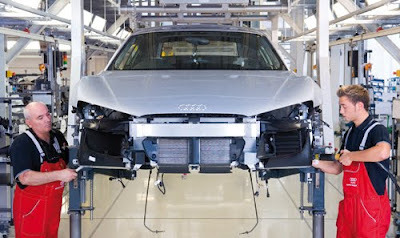 AUDI AG plans to invest more than $15 billion by 2015 in fixed assets for sustained and profitable growth. With the recent launch of the new Audi A8 in November 2010 and the expected unveiling of the all-new Audi A7 in Spring 2011, Audi is poised to have the newest, most technologically advanced offerings at the top of the luxury car market. - Sales of 101,629 best in AoA history, beating previous record by nearly 10% and creating YoY growth of 23%. - Four consecutive months of record-setting achievements; eight total months of record-breaking news. - Audi reports a string of bests: best first-quarter sales, best first-half results, and best-ever third and fourth quarters since Audi began marketing cars in the U.S.
- Sales of the 2010 Green Car of the Year Audi A3 TDI added incremental mix volume to the A3 results in 2010: A3 sales increased 69% YoY; A3 TDI sales accounted for 53% of sales mix. - Top five Audi U.S. markets gaining sales in 2010, each with more than 35% YoY growth: Washington, Orange County, Miami, Dallas and Seattle. - Second-best December on record for Audi of America with 10,546 vehicles sold, behind December 2006 with 11,897 Audi vehicles sold. - All three AoA regions set annual records, contributing to AoA’s best year ever with 22.9% YOY growth. - Continued high demand for Audi cars and SUVs results in only 34 days supply of in-stock vehicles. - Audi Q5 crossover sales in December second only to A4; up 44% YoY for December. - Audi Q7 sales up 50% YoY for December. - Audi A3 TDI is over 45% of the mix. - December 2010 CPO sales of 2,877 units represents best month since May 2008; achieving 49% YoY growth, second-best December. - 2010 total year CPO sales of 28,519 units represented Audi’s second-best CPO year ever despite smaller volumes of lease maturities. 2010 slightly eclipsed 2009 by 1%.